One year after his inauguration as President of the United States of America, this essay, which was written in December 2017, analyzes Donald Trumps behaviour in office. In comparison, the article focusses on similar populist developments in Europe, looking at the Alternative for Germany (AfD) and its Thuringian spokesman Björn Höcke. First, this article singles out the emotive potential of Trumps politics. It consults theoretical texts by Theodor W. Adorno and Hannah Arendt, comparing their classic theses with those of Uffa Jensens essay Zornpolitik (Politics of Fury, 2017), which follows an emotion studies approach. Like Vladimir Putin, Recep Tayyip Erdoğan and others, Donald Trump tries to create a constant social atmosphere of fear and anger, based on various irrational concepts of some threatening Other. Disturbed by a sub-conscious self-hatred, this aggressive projection tries to fight any doubts about the greatness of Trump as a political leader and to silence any rational critique of the populists actions as fake news. Using an old German word, Uffa Jensen defines the central emotion of such politics as Hochmut (disdainfulness). While journalists like Masha Gessen call Trumps government a near totalitarian regime, Jensen would locate Trumps sheer arrogant egoism in the familiar traditions of pure capitalistic ideology. Secondly, this essay focusses on Trumps use of the medium Twitter. 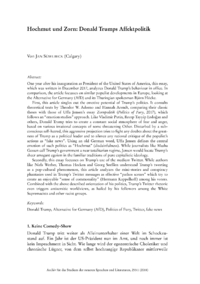 While authors like Niels Werber, Thomas Hecken and Georg Seeßlen understand Trumps tweeting as a pop-cultural phenomenon, this article analyzes the mini-stories and conspiracy phantasies used in Trumps Twitter messages as effective pathos scenes which try to create an enjoyable sense of commonality (Hermann Kappelhoff) among his voters. Combined with the above described orientation of his politics, Trumps Twitter rhetoric even triggers antisemitic worldviews, as hailed by his followers among the White Supremacists and other racist groups.